For 40 years, Pennsylvania’s nonprofit, Berks Women in Crisis has been saving lives. Berks Women in Crisis has been fighting the good fight to end domestic violence and sexual assault. Starting out at a local YWCA in the 1970s, twelve dedicated women, known as the “founding mothers,” met to plan what would become Berks Women in Crisis. Through the yeas, the scope of their lifesaving work has grown tremendously, providing a safe haven and ongoing support for victims. Their innovative advocacy and education programs increase awareness and promote the prevention of domestic violence, sexual assault and all forms of oppression. Berks Women in Crisis needed to stand out as a positive force within the community. In order to more fully understand the community’s perception of Berks Women in Crisis, the agency engaged CrossRoads Studios to conduct an in-depth strategic insight analysis. CrossRoads Studios interviewed management, board members, employees, residents and key members of the community. “Women” and “Crisis” were limiting the messaging outreach. There was a split identity because many people referred to the organization as BWIC. There was a perception that Berks Women in Crisis only provided assistance to women and girls, when in fact, they also provide services to men and boys. There is a need for everyone to feel “Safe”. Safe became the anchor for the Safe Berks re-brand. 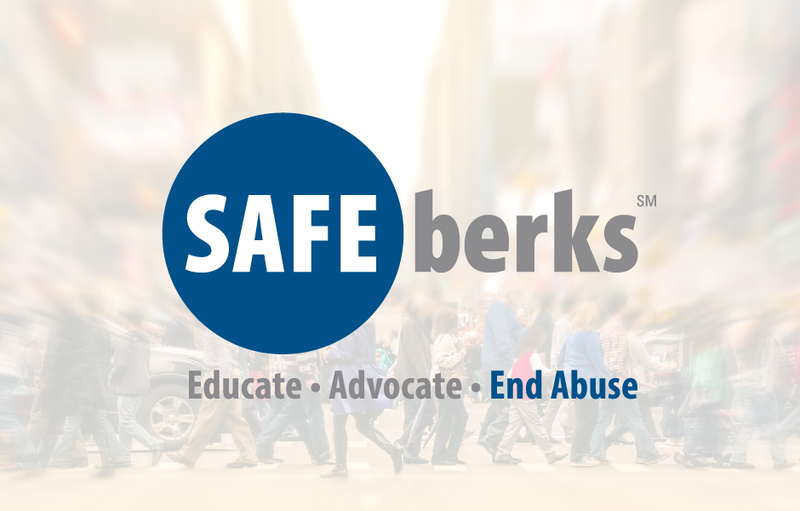 In order to clarify and focus Safe Berks, the organization implemented a powerful and succinct essence statement “Educate. Advocate. End Abuse.” with the emphasis on “End Abuse”. CrossRoads Studios worked with the Safe Berks team to develop all key elements of the brand touchpoints. These included items, such as sub-brand management, video, signage and multilingual marketing materials. One of the more intriguing developments was the medical advocacy poster, commonly referred to as the “potty poster”. This poster is applied to the inside of bathroom door stalls throughout regional schools, hospitals, public areas and private organizations. With phone and text message tear-offs, it has become a powerful way to connect to those in need. Response to the branding has been extremely positive throughout the community. 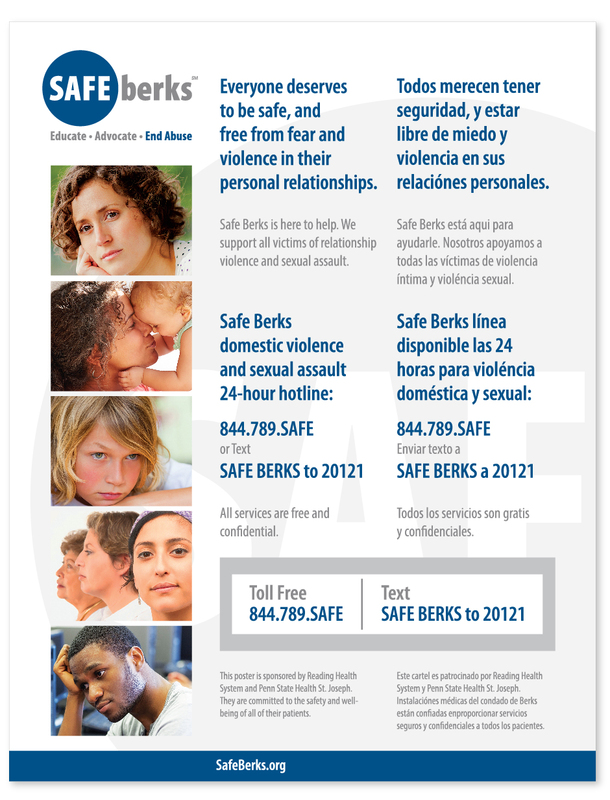 The message is clear, all forms of domestic violence and sexual assault are unacceptable and Safe Berks is here to help. When we say Berks Women in Crisis, we put the focus on the victim. When we say ‘Safe Berks,’ it is more inclusive, so we know that we all have a role to play in preventing domestic violence and sexual assault. 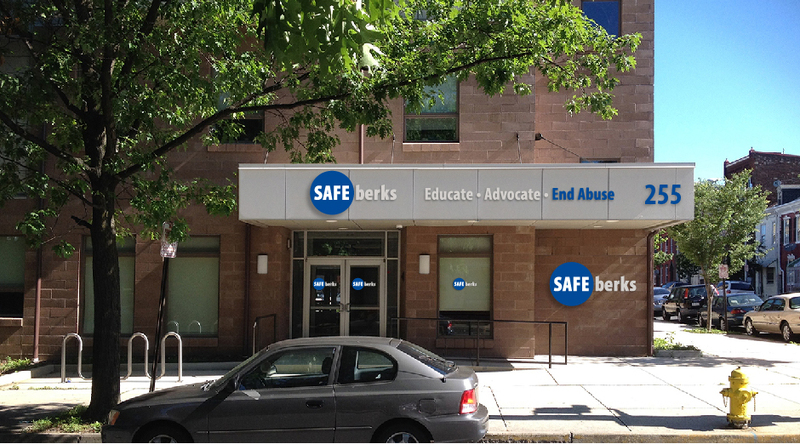 CLIENT NOTES: Safe Berks is supported by community donations and businesses, including BB&T, Comcast Corporation, Meridian Bank, Metro Bank, Tompkins VIST Bank and the University of Pittsburgh Health Plan. Service initiatives include crisis, counseling, residential, legal, education and community outreach and systems advocacy.